Veni, vidi, vici. I came, I saw, I conquered. Attributed to Julius Ceasar, 47 BC. It is done. Final sign off from City of Newport Beach inspector happened last Friday. The punch list is complete. I wrote the last check to the contractor. The porta-potty has been removed. For Mother's Day this past Sunday, I had a bath in my new tub. And Albert and I slept in the master bedroom for the first time in four and a half months. Whoot whoot. Just to give you a feel for how long a home improvement project can take, I first contacted the architect in January, 2011. It took all year to plan the addition of one bathroom, the remodel of two others and upgrades to various infrastructure items (a total of about 160 square feet added). The last three months of the year were spent getting bids and vetting contractors, and procuring necessary plan approvals, HOA approvals and permits. Construction started on January 3, 2012. And the project officially completed today May 15, 2012. Four and a half months. The contractor promised April 30. He came in very close but got a few extra weeks due to foundation issues and some small city approval delays. Do you remember the before pictures? Mid-Century Modern at its worst. Our bathroom had all of the features (small, pastels) and none of the charm (pink, foil wallpaper). because it hits the toilet. A feature perhaps? previously, the painter used latex paint on top of original oil based paint. The paint was peeling all over the place. Our fault. The guest bath got turned into a "spa" bath, keeping the aspects of mid-century we love like clean modern design, and discarding the unloved (tiny, beat up, cabinet doors that don't open all the way and yellow). The new, distinctly modern cabinets with a view of the clear glass shower. Another view of cabinet and tub. The master bath was ridiculously small. Next to the toilet, the bathroom cabinet drawers could not actually open all the way. Therefore hard to clean and therefore, disgusting. Master Bath from entrance door (toilet conveniently located in an open doorway). ridiculous until I had the brilliant idea to change it to open out. I liked this light green tile a lot and was sad to see it go. Master Bath from tub area. I actually loved the sinks the most. air it out. See the little metal thing in the tile back splash? Holds a cup and toothbrush, charming, but broken years ago. Now the master bath has a HUGE shower and a HUGE counter. have two banks of drawers. Storage is a premium in a mid-century modern. Amazing storage with triple wide medicine cabinet. And a BONUS! A third bathroom added to what was originally a 1,600 square foot mid-century modern home. It is a decent size but practical, and keeping with the modern aesthetic. Alex's new bathroom, lucky kid. Cool shower in third bathroom. 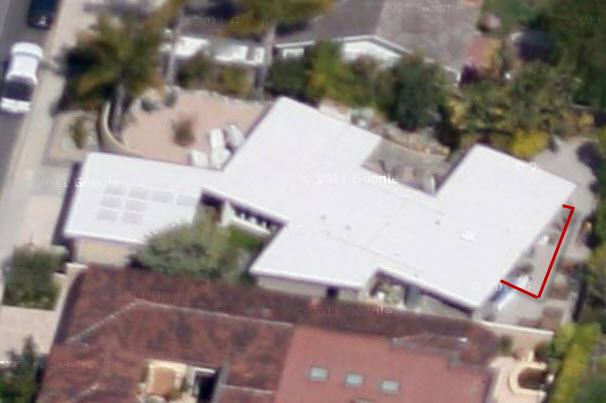 All three bathrooms have are an unusual triangular shape against the back wall due to the fact that house sits kitty corner on the lot, and we built all the way back to the 10' off the fence line allowed by the City of Newport Beach which created a triangular shaped addition. See the triangle off the back, that is what we added. Don't forget the master bedroom gained a closet... and another surprise I'll show you later. Yay. Happy Mother's Day to me. Click here for all project resources. Jager Haus in Anaheim. Yum. What a beautiful and clean/classic redo ... most outstanding! Congratulations!!!! We hope to see you on the 29th!!! Hey Joanne! Thanks very much!!! Appreciate the congratulations. Redoing my own mcm bathroom...but not sure I have enough room to push out. Love your cabinets...are they pre-built or custom? Details would be great. Hi there. Cabinets & medicine chests were custom made using Alder Slab and stained Nutmeg. Our contractor works with GNA Cabinets, 714-538-1326 located in Orange, CA. They had the electrical on the side and a light on the top. They were designed by the architect. Thank you so much. It has been about 6 months and we still love them, so that is the sign! I have lots of tile posts. http://www.midcenturymodernremodel.com/2012/03/check-specs-and-measure-tile-very.html offers some details. Or click through here for all of the tile posts: http://www.midcenturymodernremodel.com/search/label/Tile. Thanks for visiting! Hey Rebecca, thanks so much for the links! You are welcome!!! Good luck! Hello. And thank you. No interior walls were moved. We essentially just pushed out the exterior walls in the form of the pizza wedge due to the fact that house sits diagonally on the property. I don't have the previous layout except in pictures.http://www.midcenturymodernremodel.com/2012/01/let-remodel-begin-before-pictures.html. The "glamour" guest bathroom actually retains the original layout. The master is entirely different, and our son's room new bathroom is, of course, entirely new.